With the growth of virtualization, cloud-based services and applications like VoIP, video streaming and IP surveillance, SMB networks need to extend beyond simple reliability to higher speed and performance. As a leading provider of networking equipment for SMBs, Netgear had launched a variety of cost-effective 10GBASE-T switches including Netgear ProSAFE XS708Ev2, XS716E, XS708T, XS712T, XS716T, XS728T, XS748T and XSM7224. When looking for a lower cost and high capacity 10GBASE-T switch in SMB home/office lab environments, the Netgear ProSAFE XS712T is one of the best options. It comes in at around $1,100 at Amazon which is more budget friendly than the larger data center switches. This article will review the Netgear ProSAFE XS712T (XS712T-100NES) 10GBASE-T switch. Netgear ProSAFE XS712T is a powerful smart managed switch that comes with 10 dedicated 10GBASE-T RJ-45 copper ports supporting 100M/1G/10G speeds and 2 combo copper/SFP+ fiber 10G ports. The 2 combo SFP+ ports can be used as 10GASE-T ports or as SFP+ 10Gb Ethernet ports. This is an awesome feature as it allows an inexpensive SPF+ link via DAC to a 24 or 48 port 1Gb Ethernet switch for non-10Gb networking needs. All ports can automatically negotiate to the highest speed, which makes the switch ideal for environments that have a mix of Ethernet, Fast Ethernet, Gigabit Ethernet, or 10-Gigabit Ethernet devices. Cat 5e/Cat 6/Cat 6a/Cat 7 can be used to make 10G connections. Cat 6a/Cat 7 cables are recommended if the cable distance is greater than 45 meters. Besides, the smart switch can be freestanding or rack mounted in a wiring closet or equipment room. This 10G smart managed switch is purposely designed as a cost-effective way to provide 10G connections to 10G-capable servers and NAS (Network Attached Storage) systems. It also can be used at the center of a small business network or as an aggregation/access switch in a larger organization. The RJ-45 copper ports of XS712T comply with IEEE 10GBASE-T standards. They support low-latency, line-rate 10G copper “Base-T” technology with backward compatibility to Fast Ethernet and Gigabit Ethernet. So it allows for a cost effective and simpler upgrade path to 10-Gigabit Ethernet. The existing Cat5/Cat5e is supported for Gigabit speeds up to 100 meters, Cat6 for 10-Gigabit speeds up to 45 meters and Cat6a/Cat7 for 10GBASE-T connection up to 100 meter. The powerful L2+/Layer 3 Lite features make XS712T the most cost-effective core switches for SMB and virtualization environment. This switch is also a future-proofing choice with 10G bandwidth, advanced traffic management and comprehensive IPv6 support. The XS712T used as a aggregation switch has many useful purposes. It can help to resolve the congestion issue between network edge and core, which is caused by the broader adoption of Gigabit-to-the-desktop. Unlike multiple Gigabit Ethernet links, it provides greater scalability resulting in a simplified and highly efficient network infrastructure. What’s more, it can reduce cabling complexity because it can use existing cabling efficiently. As mentioned above, The Netgear ProSAFE XS712T smart switch provides 12 twisted-pair ports that support nonstop 100M/1000M/10G networks. The switch also has two built-in SFP+ GBIC combo slots that support 1000M and 10G optical modules. 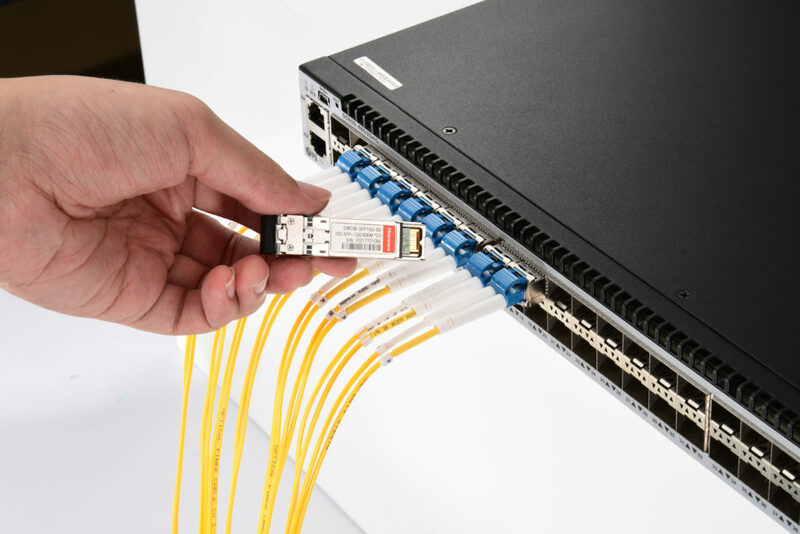 Using these Gigabit slots, 100M/1000M/10G copper and 1000M/10G fiber connectivity can create high-speed connections to a server or network backbone. So 1000BASE-T SFP copper transceiver, 1000BASE SFP and 10G SFP+ transceivers are suitable for this switch. The following table lists the compatible transceivers and optic cables from FS.COM. The Netgear XS712T (XS712T-100NES) provides a solid cost-effective solution especially for those with SMB home/ office lab environments. If you are seeking for afforable 10GBASE-T switch for your home lab, the XS712T can be taken into consideration. What’s more, the compatible fiber transceivers and cables can be found in many third party vendors with reasonable prices, such as cablestogo, fluxlight, smartoptics, FS.COM, and etc. You have a lot of choices to save money. Owing to the rapid progresses made in fiber optical technology, more and more networking infrastructure installations and upgrades choose fiber optic links for high-data-rate transmission. There is no question that compared with copper solutions, fiber optics provides greater bandwidth, more reliable data transmission, and immunity to electromagnetic interference and radio-frequency interference (EMI/RFI), crosstalk, impedance problems, and more. For constituting such fiber optic links, fiber optic module, one of the fast-growing transmission components, are instrumental, and work well in these applications where high-bandwidth and long-distance transmission are needed. Along with the fiber optical technology advances, fiber optic module has been constantly designed and reinnovated, so as to better facilitate electrical-optical-electrical signal conversion. They are classified into several categories according to different standards regarding package, transmission mode, data rate and power supply. This text will talk about every classification standard in details. MSAs (Multi-Source Agreements) are agreements between multiple manufacturers, system integrators, and suppliers, specifying parameters for system components and their guideline values, such as the electrical and optical interfaces, mechanical dimensions and electro-magnetic values. The equipment vendors follow these MSA defined values for designing their systems to ensure interoperability between interface modules. The form-factor or the MSA-type is needed so that the transceiver can mechanically and electrically fit into a given switch, router, etc. Transceiver MSAs define mechanical form factors including electric interface as well as power consumption and cable connector types. There are various MSA types: SFP (eg. E1MG-TX), SFP+, QSFP and so on. When talking about this standard, single mode optical modules and multi-mode optical modules come to the central point. Single-mode optical modules, or single-mode transceivers, just as their name show, are designed to work over single mode fibers (SMFs). Compared with multimode fiber (MMF), SMF fiber core is smaller and the wavelength of the laser is narrower, meaning that while transmitting optical signals, SMF is able to deliver higher bandwidth at the much longer distances, like 2km, 10km, 40km, 60km, 80km and 120km transmission. Commonly-seen single-mode transceiver types include 10GBASE-LR, 1000BASE-LR, 1000BASE-BX, etc..
Multimode optical modules, or multimode transceivers, operate over MMF which uses a much bigger core and usually uses a longer wavelength of light. Thus, the optics used in MMF has a higher capability to gather light from the laser, for short distance transmission, with distance reach ranging from 100m to 500m. 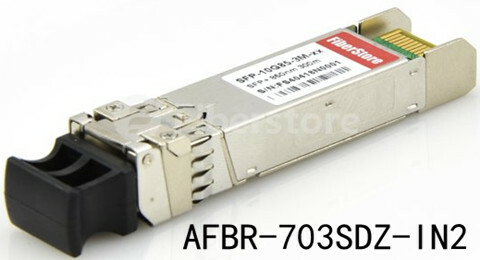 10GBASE-SR is one of the most widely-used multi-mode transceiver types, such as AFBR-703SDZ-IN2. This Avago Intel compatible 10GBASE-SR SFP+ transceiver listed in FS.COM works over MMF with 850nm laser light for 300m distance reach. The connection between two network devices is realized with the help of protocols. It is imperative to know which protocol and data rate the switch or router supports. There are various protocols such as Ethernet, Fiber Channel (FC), InfiniBand, SONET/SDH, CPRI and so on. Each of these protocols supports their own data rates. For example Gigabit Ethernet (GbE) can range from 1Gb/s to 100Gb/s, while FC ranges from 1GFC (1.0625Gb/s) to 16GFC (14.025Gb/s). As for power supply, there are built-in switching power transceiver and eternal power supply transceiver. The built-in switching power transceiver is designed for the carrier grade power. It supports equipment power protection, filters, and a wide power supply voltage regulator, reducing the external point of failure arising from the mechanical contact. By contrast,the external power supply transceiver is made for multi-use civilian equipment, and it is compact and cheap. Of course, the classification standards of fiber optic module is not limited to those three points mentioned above. Other standards are also workable, such as the network management standard. It’s known that there are managed optical modules and unmanaged optical modules. The former type allows additional network monitoring with fault detection, free from configuration function. By contrast, the latter, without monitoring function, allows automatic communication of the devices that are connected to unmanaged optical modules. When your networking projects call for fiber optic module for fiber optic links, these classification standards will work, since they help you to choose the right fiber optic modules for applications to ensure the reliable data transmission. FS.COM offers an ocean of fiber optic modules which are fully compatible with major brands, including the Brocade E1MGTX, and Avago Intel AFBR-703SDZ-IN2 mentioned above. A continuous stream of manufacturing process improvements and product innovations has given fiber optical system several advantages, like longer distance reach, larger data-carrying capacity, greater bandwidth and lower power consumption. Among these fiber optical product innovations, hot-pluggable 1000BASE-X transceiver modules should come to the central point with their unique designs. They have been constantly designed, and finally been reinvented as hot-pluggable modules along with the optical technological advances. These small, hot-pluggable serve as the key components in accommodating the demands of higher port density and more networking flexibility. Transceiver module comes into various types: SFP (small form-factor pluggable), SFP+ (small form-factor pluggable plus), QSFP+ (quad small form-factor pluggable plus), etc. This article mainly introduces SFP transceiver modules which are widely applied in Gigabit Ethernet (GbE) applications, with the focus on several 1000BASE-X interface types, including 1000BASE-SX, 1000BASE-LX, 1000BASE-EX, and 1000BASE-BX10-D/U. 1000BASE-SX SFP, compatible with the IEEE 802.3z 1000BASE-SX standard, operates on legacy 50μm multi-mode fiber (MMF) links up to 550m and on 62.5μm Fiber Distributed Data Interface (FDDI)-grade MMFs up to 220m. Take DEM-311GT for example, Fiberstore compatible D-Link 1000BASE-SX SFP is able to realize 550m link length through OM2 MMF with duplex LC. 1000BASE-LX SFP, compatible with the IEEE 802.3z 1000BASE-LX standard, is specified to support link length of up to 10km on standard single-mode fiber (SMF), to 550m on MMFs. When used over legacy MMF, the transmitter should be coupled through a mode conditioning patch cable. The laser is launched at a precise offset from the center of the fiber which causes it to spread across the diameter of the fiber core, reducing the effect known as differential mode delay which occurs when the laser couples onto only a small number of available modes in MMF. 1000BASE-EX, sometimes referred to as LH, is a non-standard but industry accepted standard which works on standard SMF with fiber link spans up to 40km in length. For back-to-back connectivity, a 5-dB inline optical attenuator should be inserted between the fiber optic cable and the receiving port on the SFP at each end of the link. 1000BASE-EX SFPs (eg. GLC-EX-SMD) run on 1310nm wavelength lasers, and achieves 40km link length. The 1000BASE-BX-D and 1000BASE-BX-U SFPs, compatible with the IEEE 802.3ah 1000BASE-BX10-D and 1000BASE-BX10-U standards, operate on a single strand of standard SMF (figure shown below). A 1000BASE-BX10-D device is always connected to a 1000BASE-BX10-U device by a single strand of standard SMF with an operating transmission distance up to 10km. The communication over a single strand of fiber is accomplished by separating the transmission wavelength of the two devices (figure shown above): 1000BASE-BX10-D transmits a 1490nm channel and receives a 1310nm signal, whereas 1000BASE-BX10-U transmits at a 1310-nm wavelength and receives a 1490-nm signal. In this figure, the wavelength-division multiplexing (WDM) splitter is integrated into the SFP to split the 1310nm and 1490nm light paths. These 1000BASE-X SFP modules provide physical layer connectivity for optical-port modular switch IO blades and optical-port stackable switches, reliable, and cost-effective choices to accommodate varied and evolving network demands. As a professional fiber optic product manufacturer and supplier, Fiberstore supplies all the above-mentioned several 1000BASE-X SFP modules which are all test- and quality-assured. You can visit Fiberstore for more information about 1000BASE-X SFP modules. Thanks to the advances made in fiber optical technologies, fiber solutions have been deployed in ever-increasing applications where high-speed and high-performance data transmission is needed. They outweigh the copper solutions in such aspects as higher bandwidth, longer distances and Electromagnetic interference (EMI) immunity. Transceiver module, one of the key components required in such fiber connections for high networking performance, have experienced the never-ceasing industrial designs, from lower port density to higher, from the standard modules to the final hot-pluggable ones, to meet the ever more flexible networking infrastructure. There is a broad selection of hot-pluggable transceiver modules available for fiber networking use, and you may feel a little confused about how to select the correct transceiver module for your networking transmission. In this article, I will illustrate different aspects of transceivers that need to be known before choosing a transceiver. Before giving guidance to transceiver selection, it’s necessary to know the basics of transceiver. Transceiver is a combination of a transmitter and a receiver in a single package, while they function independently for bidirectional communication. Typically, a fiber optic transceiver converts the incoming optical signal to electrical and the outgoing electrical signal to optical. More specifically, the transmitter takes an electrical input and converts it to an optical output from a laser diode or LED. The light from the transmitter is coupled into the fiber with a connector and is transmitted through the fiber optic cable plant. The light from the end of the fiber is coupled to a receiver where a detector converts the light into an electrical signal which is then conditioned properly for use by the receiving equipment. Here go the several aspects of transceiver modules that are helpful in your purchasing. Multi-source agreements (MSAs) between different equipment vendors specify guidelines for electrical and optical interfaces, mechanical dimensions and electro-magnetic specification of a transceiver module. The equipment vendors follow these MSA defined values for designing their systems to ensure interoperability between interface modules. The form-factor or the MSA-type is needed so that the transceiver can mechanically and electrically fit into a given switch, router, etc. Transceiver MSAs define mechanical form factors including electric interface as well as power consumption and cable connector types. There are various MSA types: SFP (eg. MGBSX1), SFP+, XFP, CFP, CFP2, CFP4, QSFP and so on. Transceivers can work over single-mode fiber (SMF), multi-mode fiber (MMF), and copper. In different Ethernet applications, media can achieve different link lengths when combined with transceivers. Take Gigabit Ethernet (GbE) applications for example, single mode SFP transceivers can have a transmission distance of 5km to 120km, while multimode SFP transceivers are defined to have the maximum reach of 55om, with copper solution establishing even fewer link length at 25m. Take MGBLX1 for example, this Cisco compatible 1000BASE-LX SFP works through SMF for 10km reach. The transceiver power budget is the difference between transmitter launch power and receiver sensitivity and has to be 2-3dB larger (Margin) than the measured link loss. If the link loss cannot be measured, it has to be calculated. Therefore transmission distance [km], the number of ODFs, patches and passive optical components (Muxes) have to be known. Common values for power budget are <10, 14, 20, 24, 28, >30dB. If you’re seeking high-speed data carrier, transceivers can help accomplish goals. By transmitting data at 10Gbit/s, 40Gbit/s, 100Gbit/s or 12940Gbit/s, they can ensure that data arrives quickly. Transceiver modules that are capable of handling fast speeds can help with downloads and high and low bandwidth video transmission. Transceiver modules are instrumental in ensuring that the data is transmitted securely, expeditiously, and accurately across the media. Choosing the right type of transceiver for your network is not always easy, but knowing above discussed parameters beforehand helps you narrow it down to a few transceivers. FS.COM offers a sea of transceiver modules which are fully compatible with major brands, like the above mentioned MGBSX1 and MGBLX1, the Cisco compatible transceiver modules. The rapid expansion of fiber optic networks, including data services measured by data volume or bandwidth, shows that fiber optic transmission technology is and will continue to be a significant part of future networking systems. Network designers are becoming increasingly comfortable with fiber solutions, since the use of which allows for more flexible network architecture and other advantages, such as EMI (Electromagnetic Interference) resilience and data security. Optical transceiver plays an really important role in these fiber connections. And while designing fiber optic transceivers, three aspects need to be considered: environmental situation, electrical condition and optical performance. What Is a Optical Transceiver? The optical transceiver is a self-contained component that transmits and receives signals. Usually, it is inserted in devices such as routers or network interface cards which provide one or more transceiver module slot. The transmitter takes an electrical input and converts it to an optical output from a laser diode or LED. The light from the transmitter is coupled into the fiber with a connector and is transmitted through the fiber optic cable plant. Then the light from the end of the fiber is coupled to a receiver where a detector converts the light into an electrical signal which is then conditioned properly for use by the receiving equipment. There are a full range of optical transceivers available in telecommunication market, like SFP transceiver, SFP+ transceiver (eg. 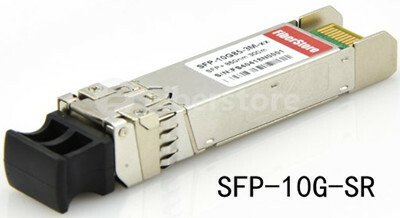 SFP-10G-SR shown below), 40G QSFP+, 100G CFP, etc. It’s true that fiber links can handle higher data rates over longer distances than copper solutions, which drive the even wider use of optical transceivers. While designing fiber optic transceivers, the following aspects should be taken into consideration. One challenge comes to the outside weather—especially severe weather at elevated or exposed heights. The components must operate over extreme environmental conditions, over a wider temperature range. The second environmental issue related to the optical transceiver design is the host board environment which contains the system power dissipation and thermal dissipation characteristics. A major advantage of the fiber optic transceiver is the relatively low electrical power requirements. However, this low power does not exactly mean that the thermal design can be ignored when assembling a host configuration. Sufficient ventilation or airflow should be included to help dissipate thermal energy that is drawn off the module. Part of this requirement is addressed by the standardized SFP cage which is mounted on the host board and also serves as a conduit for thermal energy. Case temperature reported by the Digital Monitor Interface (DMI), when the host operates at its maximum design temperature, is the ultimate test of the effectiveness of the overall system thermal design. Essentially, the fiber transceiver is an electrical device. In order to maintain error free performance for the data passing through the module, the power supply to the module must be stable and noise-free. What’s more, the power supply driving the transceiver must be appropriately filtered. The typical filters have been specified in the Multisource Agreements (MSAs) which have guided the original designs for these transceivers. One such design in the SFF-8431 specification is shown below. Optical performance is measured as Bit Error Rate, or BER. The problem facing designing optical transceiver lie in the case that the optical parameters for the transmitter and receiver have to be controlled, so that any possible degradation of the optical signal while traveling along the fibers will not cause poor BER performance. The primary parameter of relevance is the BER of the complete link. That is, the start of the link is the source of the electrical signals which drive the transmitter, and at the end, the electrical signal is received and interpreted by the circuitry in the host by the receiver. For those communication links which use optical transceivers, the primary goal is to guarantee BER performance at different link distances, and to ensure broad interoperability with third party transceivers from different vendors. Fiber technology is becoming maturer, leading to the wider use of optical transceivers. With the three aspects mentioned above in mind, designing fiber optic transceivers should be easier. FS.COM supplies many transceivers which are fully compatible with major brands, including HP compatible transceivers (eg. J4858C). The push behind users’ requests for high-quality video content, whether for live Internet video or video downloads from servers, is the principal driver of extremely high growth of Internet traffic. Besides, more and more complex technical computing applications are demanding even greater bandwidth. In such cases, these SFP+, QSFP+ and CXP high density host ports are used to increase the bandwidth, enabling the high speed networking connections. This article gives an overview of these three ports, including their cabling solutions and bandwidth density. Leading companies and industry organizations related to telecommunications have made their great efforts to develop specifications to assure commonality, compatibility and networking functionality of hardware connections, signaling and software communications. These specifications for high speed networking solutions include SFP+, QSFP+ and CXP links. In today’s data center, SFP+ links are supplanting SFP links for both Ethernet and Fibre Channel. Using the same board space as SFP, SFP+ provides a 10x bandwidth improvement over SFP for Ethernet (10Gb/s vs. 1Gb/s) and 2x improvement for Fibre Channel (8.5Gb/s vs. 4.25Gb/s). The SFP+ system also offers capability to freely designate or configure any available system port with either copper- or fiber-based cabling as dictated by the specific installation environment. The other two high speed parallel link specifications which allow for even higher bandwidth are QSFP+ and CXP systems. The QSFP+ system uses a 4 x 10 Gb/s link configuration for a 40Gb/s port. Similarly, the CXP system provides 12 lanes that can be deployed to support 100 to 120Gb/s aggregated port bandwidth. QSFP+ and CXP are specified for 4x and 12x Infiniband Quad Data Rate (QDR) interconnect links. CXP ports can also be used for 40G links. The comparison among these three ports starts form their cabling solutions, then bandwidth density. The SFP+, QSFP+ or CXP host ports can accept either a passive copper-based cable solution for generally cable lengths of 5 to 7 meters, an active copper-based cable solution for typical cable lengths up to 15meters (or longer depending on the acceptance criteria), or a plug-in optical transceiver module with an optical connector on the rear of the module to accept passive fiber optic cable assemblies to enable even longer cable lengths. These cabling approaches enable flexibility to configure the cables needed to cater to different working environments. Take QSFP+ copper cabling solutions for example, Intel XLDACBL5 is the QSFP+ to QSFP+ passive copper cable assembly designed for 40-gigabit links with the distance up to 5m. Fiberstore compatible Intel XLDACBL5 is shown below. With the widespread use of QSFP+ for Ethernet transmission in high performance computing systems, there emerged a fourth cabling solution: active optical cable (AOC) assembly. In an AOC, the optical fiber is terminated directly to an optical transceiver that is sealed within the metal backshell on each end of the cable assembly. The integrated electro-optical assembly lowers cost in component reduction and presents an electrical interface to the outside world. Like 721070-B21 module, Fiberstore compatible HP 721070-B21 is the QSFP+ to 4SFP+ breakout AOC assembly used for 40G links. These high density SFP+, QSFP+ and CXP ports can provide increased communications bandwidth for data center networking. Fiberstore offers various SFP+, QSFP+ and CXP ports, and their cabling solutions. These cabling modules are fully compatible with major brands, like Intel (XLDACBL5), HP (721070-B21), Dell and Force 10 (CBL-QSFP-40GE-PASS-1M). You can visit Fiberstore to know more about SFP+, QSFP+ and CXP ports. How to Achieve a Reliable, Affordable and Simple 10 Gigabit Ethernet Deployment? 10 Gigabit Ethernet, or 10GE and 10GbE, is a group of computer networking technologies for transmitting Ethernet frames at a rate of 10 gigabits per second. Nowadays, 10 Gigabit Ethernet is gaining broader deployments by the increasing bandwidth requirements and the growth of enterprise applications. But there is a question to be considered when deploying 10 Gigabit Ethernet — how to achieve a reliable, affordable and simple 10 Gigabit Ethernet deployment? The text below will tell the answer. Server virtualization supports several applications and operating systems on a single server by defining multiple virtual machines on the server. Virtual machines grow and require larger amounts of storage than one physical server can provide. Storage area networks (SANs) or network attached storage (NAS) provide additional and dedicated storage for virtual machines. But connectivity between the servers and storage must be fast to avoid bottlenecks. 10 Gigabit Ethernet is able to provide fastest interconnectivity for virtualized environments. The Internet Small Computer System Interface (iSCSI), an extension of SCSI protocol used for block transfers in most storage devices and Fibre Channel, is making 10 Gigabit Ethernet an attractive, alternative interconnect fabric for SAN applications. The iSCSI capabilities allow 10 Gigabit Ethernet to compare very favorably to Fibre Channel as a SAN interconnect fabric. 10GbE networking can reduce equipment and management costs as its components are less expensive than highly specialized Fibre Channel components and do not require a specialized skill set for installation and management. 10 Gigabit Ethernet allows the aggregation layer to scale to meet the increasing demands of users and applications. It can help bring oversubscription ratios back in line with network-design best practices, and provides some important advantages over aggregating multiple Gigabit Ethernet link, such as less fiber usage, greater support for large streams and longer deployment lifetimes. For any fiber cable deployment, the types of fiber cable, 10 Gigabit Ethernet physical interface and optics module form factor need to be considered. Form factor options are interoperable as long as the 10 Gigabit Ethernet physical interface type is the same on both ends of the fiber link. Currently, three different copper cabling technologies for 10 Gigabit Ethernet are available. 10GBASE-CX4 was the first 10 Gigabit Ethernet copper standard. CX4 was relatively economical and allowed for very low latency. Its disadvantage was a too-large form factor for high density port counts in aggregation switches. SFP+ direct attach cables (DAC) connect directly into an SFP+ housing. It has become the connectivity of choice for servers and storage devices in a rack due to its low latency, small form factor and reasonable cost. 10GBASE-T is able to run 10 Gigabit Ethernet over CAT6a and CAT7 copper cabling up to 100 meters, but it needs technology improvements to lower its cost, power consumption and latency. SFP+ direct attach cables integrate SFP+ connectors with a copper cable into a low-latency, energy-efficient, and low-cost solution. Direct attach cables are currently the best cabling option for short 10 Gigabit Ethernet connections. The Link Aggregation Control Protocol (LACP) standard defines a way of bundling several physical ports over one logical channel. From a deployment standpoint, it is far easier to implement a distributed LACP solution with stackable switches that allow link aggregation across the stack. 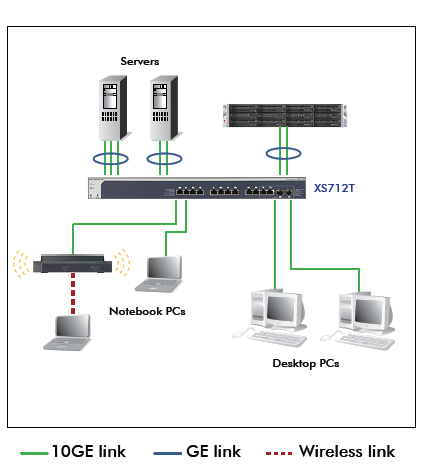 In this configuration, the stack acts as a single logical switch and link aggregation is seamless. The diagram below shows a stackable 10 Gigabit Ethernet ToR switching solution enabling cost-effective SAN connectivity for servers and network storage. In addition to better performance, LACP functionality provides better availability and redundancy for servers and storage. Moreover, it provides failover protection if one physical link goes down, while iSCSI traffic load balancing ensures greater transmission throughput with lower latency. The diagram below shows Gigabit access switches with 10 Gigabit uplinks and stackable 10 Gigabit aggregation switches. At the edge, stacks of access switches are virtualized into a single switch, reducing configuration and management overhead. To achieve a reliable, affordable and simple 10 Gigabit Ethernet deployment, the factors stated above need to be considered. Fiberstore SFP+ transceivers and SFP+ direct attach cables are ideal for cost-sensitive organizations considering 10 Gigabit Ethernet applications and they help growing companies support rising bandwidth requirements, new applications, and the demands of a fast-paced business environment. When it comes to fiber optic transceiver, we can easily think of a lot of different package formats like 1X9, GBIC, SFF, SFP, etc. 1X9 package optical module was first produced in 1999, with SC head, is fixed optical transceiver products, usually directly solidified on the circuit board of communication equipment, used as a fixed optical module. Then, 1X9 package optical module was gradually developed towards miniaturization and hot-pluggable. Fiber optical module products began to develop in two aspects. One is hot-pluggable optical module, which became GBIC. The other is small, with LC head, directly solidified to the circuit board, which became SFF 2X5, or SFF 2X10. 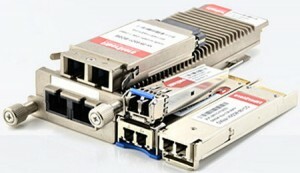 Both GBIC and SFF optical modules have been widely used. GBIC module, once widely used in switches, routers and other network products. The old Cisco and other vendors’ switched and routers have been widely adopted GBIC modules. Compared with 1X9, GBIC has obvious advantages, hot-pluggable feature makes GBIC can used as an independent module, users can easily maintain, update fiber optic transceiver and fault location. However, with the continuous development of network, GBIC module’s shortcomings also gradually appeared. The main disadvantage is its large size, resulting in a smaller density of service boards, boards can not accommodate a sufficient number of GBIC, unable to adapt to the trend of rapid development of network. SFF module, is another branch of fiber optic modules’ evolution, now is widely used in EPON system. In the EPON ONU system, all adopt SFF module. The main reason why ONU use SFF optical module is EPON ONU products are usually placed in the users, require fixed rather than hot-pluggabe. With the rapid development of EPON technology, SFF market is gradually expanding. SFP is the latest fiber optic transceiver, also is the most widely used module currently. SFP module is hot-pluggabe (like GBIC) and small (like SFF). Using LC head, and its size is small as 1/2 to 1/3 as that of GBIC Module, which greatly increases the port density of network device, adaptable to the trend of the rapid development of the network, so it has been the most widely used. Currently the main equipment manufacturers, without exception, no one abandoned GBIC products and only produce SFP transceiver. Thanks to the centralized standards, SFP modules from different manufacturers can be compatible with each other, SFP is available as a stand-alone network equipment. According to the rate, fiber optic transceiver can be divided into 100Base, 1000Base (Gigabit) and 10GE for Ethernet, 155M, 622M, 2.5G and 10G for SDH, which all have been widely used, and now the rate of 40G and 100G has appeared. 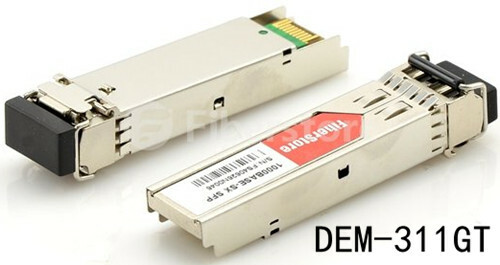 The 10G modules are widely used in the main transmission, mainly include XENPAK, X2, XFP and 10G SFP+. XENPAK module is an important step in the evolution. XENPAK in architecture for media access controller provides a XAUI interface. Serializer / deserializer to 10 Gbps available payload and forward error correction overhead assigned to the interface 4 channels, each one line signaling rate decreased to 3.125 Gbps. Compared with non-hot-pluggable, XENPAK module is very attractive, but it can not meet the demand of some important market. XENPAK power is typically 10W, caused a certain influence on the structure of size. Because it increases the printed circuit board manufacturing costs and reduce valuable trace space. X2 transceiver also uses electrical interface(like XENPAK), but there are a few exceptions. X2 provides a 4-bit port address space, a bit less than XENPAK. X2 also reduces the number of power pins, and the bottom plate and electrical grounding utilities. X2 retained the 4 vendor-specific pin as Xenpak. In optical technology, X2 supports 10GbE, OC192 SONET, 10GFC and other standards. XFP (10 Gb small form factor pluggable module), it provides a architecture with its four-channel interface different from XENPAK. XFP is a single-channel serial module using a XFI (10 Gb Serial Interface) connection at full speed, can replace XENPAK and its derived products. 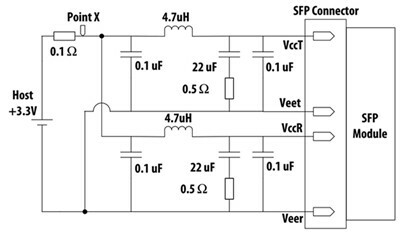 Without serializer / deserializer, XFP is smaller, cheaper and less power consumption. SFP+ module is smaller than XFP, the circuit for clock and data recovery is transferred to the card from the chip. SFP+ module compressed size and power consumption through putting the CDR and electronic dispersion compensation outside the module. No matter how fiber optical module develops, it has its own direction. Currently fiber optical transceiver mainly toward the directions of miniaturization, low cost, low power, high speed, long distance and hot pluggable. A compact hot plug fiber optic transceiver, the Small Form-Factor pluggable SFP module is used in fiber optic communications for telecommunication and data communications applications. SFP is the interface between a network device mother board and a fiber optic or copper cable network cable. The SFP module is able to support Gigabit Ethernet, fiber channel, SONET, and a number of other communications standards. For your information that in the near future, SFP will expand to the SFP+. At the time, the data rate in 10 Gbit/s is a chievable, including 8 billion fiber channel. Compared to Xenpack or XFP type of modules, all of their circuitry inside, an SFP+ module leaves some of its circuitry to be implemented on the host board. There is a huge change in the optical transciever is a vailable, each with different transmitter or receiver. This allows the user configure and customize the transceiver to get the proper optical reach with either a multimode fiber or single mode fiber type. In addition, the optical SFP module comes in four categories -SX, which is 850nm, LX, which is 1310nm, ZX, which is 1550nm and DWDM. All of them have an interface of a copper cable which permits a mother board to communicate via USTP (unshielded twisted-pair) cable network. There are also a coarse wavelength division multiplexing and two-way optical fiber cable, single mode 1310/1490 nm upsteam and downstream. Actually available, the SFP module has the capability transfer rates of up to 4.25 Gbit/s. XFP, a form factor which is virtually identical to the SFP type, increases this amount by nearly three times, at 10Gbit/s. The SFP transceiver is specified and made compatible via a multi-source agreement (MSA) between manufacturers, so that different users who may use equipment from different manufacturers and provides can work effectively and smoothly without worrying about errors and inconveniences. The GBIC interface is the precursor to the SFP, hence it’s nicknamed as mini gbic. However, the SFP module allows greater port density (number of transceivers per inch along the edge of a mother board) than the GBIC. Also exist the identical Small Form-Factor (SFF) transceiver which is about similar size as the SFP. Rather than plugged into an edge-card socket, it is directly attached to the mother board as a pin through-hole device. Digital optical monitoring (DOM) or digital diagnostics monitoring (DOM) funcations are supported by the modern optical SFP transceiver according to the industry specifications of the SFP-8472 MSA. The user has the ability to constantly monitor real-time parameters of the SFP, such as optical input/outp power, supply voltage and laser bias current because of this feature. That have been said, I’m very glad to know that optical transceiver is a very popular format, it is recommended to use a considerable amount of fiber optic component suppliers. These companies carry SFP transceivers for all Cisco devices together with transceiver modules for many other manufacturers. So, if you need technology solutions for your networking applications, you now know what to look for. Outfitting servers, all new SFP transceiver can be wind up costing a company a few thousand dollars, but investment is necessary, becaused these products provided by the reliability and effective means of communication. Most companies in the market for new modules tend to search online or call a businessman help equip their computer products. Rather than call a dealer or visit a random middlemen, you should check your buying process, where you can save the replacement equipment outside of the OEM or custom objects in order to save cost. Purchasing SFP transceiver from an OEM can cost 50-100 dollars more than you would like, but manufacturers that sell similar items tend to cost much less and manage to come with the same type of facets. Instead of SFP transceivers to help save a ton of money, because they can do everything, why wouldn’t you want to buy these items? For a company looking to lessen its bottom line, why not think about these alternatives to help minimize the costs and go around dealing with the OEM for the product you need. Some individuals cringe when they hear the products is “used” and believe that an old module tends to not have as much value and life as a new module, but ignore this common myth. For instance, you might buy a Cisco GLC-T module at a used price, but the Cisco brand is regarded for its reliability and features that will not break down after a few months of use. With suppliers provide extended warranties on these items and left the orginal cost discount interest rate 50%, than looks diffcult, anyone want to refuse to bargain, are provided here. Well, so the theme of the article is to help people find ways to save money on modules, but the warranty is to invest later road will also clearly the dividend to investors. Okay, so say you end up with the newest Cisco compatible sfp transceiver for your systems, but some of them break down after a year because of a ruined lens. You’ve gone past your manufacturer warranty and now you have to spend an extra 300-500 dollars for a replacement. Now, if you would have spent the extra money on a warranty, you could have been spared the hassle of throwing away those three hundred dollars. A warranty is only insrance, but it is always an extra motivation, help you save a large sum of cash if one day, you need it. FiberStore focus on providing high quality fiber optic cable, Cisco GLC-T, Cisco compatible SFP modules, mini gbic, and related products for local and wide area networking products. We stock optical transceivers from top suppliers. FiberStore is convinced the path to success is through excellence and customer service. Our customers are our number one priority. We know you have many choice of where to buy so we do our best to provide the best sfp and gbic products, at the best prices with the best possible support.